V1008. RICHARD CROOKS, w.Frank La Forge (Pf. 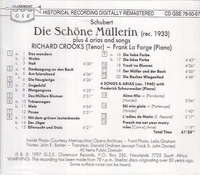 ): DIE SCHÖNE MÜLLERIN (Complete Cycle, w.several Unpublished parts, 1933) (Schubert); Richard Crooks, w.Frederick Schauwecker (Pf. ): Songs & Arias by Arne, Handel & Pessard, recorded 1940. (South Africa) Claremont GSE 78-50-67. Long Out of Print. Final copies! "...Crooks'...voice was by far the most attractive among the American tenors of his generation, combining the sweet Irish lilt of a John McCormack with the weightier accents of a German lyric....he was a favorite with Toscanini, Walter, and Mengelberg - under the latter's baton, Crooks participated in the American première of Mahler's DAS LIED VON DER ERDE."